The ceremonial first pitch was thrown out by Deputy Blaine Gaskill, the St. Mary’s County, Maryland, school resource officer who confronted the shooter at Great Mills High School on March 20. 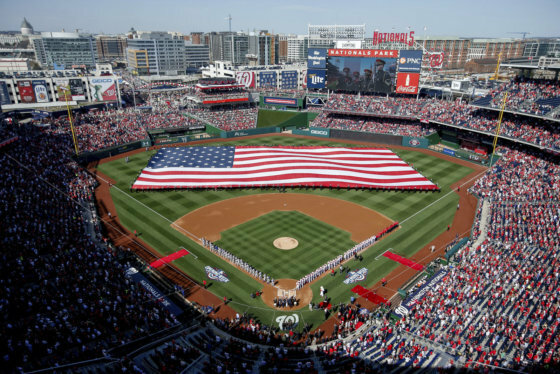 The Washington Nationals (4-2) take on the New York Mets (4-1) Thursday for the Nats’ home opener. Stephen Strasburg will start for the Nats, facing off against Mets rival Jacob deGrom. Here’s everything you need to know about getting to the game and having a ball. Gates open at 11 a.m., and the team said all fans should enter through the gates closest to their seats to avoid a traffic jam at the Center Field Gate. 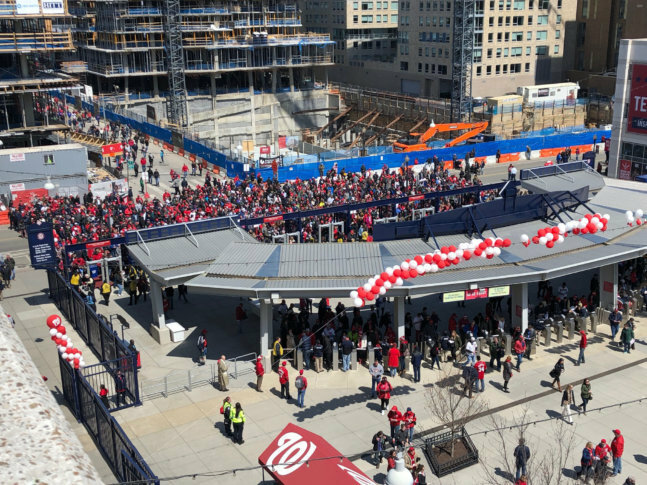 You can get to Nats Park by Metro, bike, bus, even boat, and there are changes to parking, traffic and ride sharing near the park. The Nationals’ website has a section on the various ways to get there. A few grandstand seats for sections 401 and 402 will go on sale for $15 at the main box office at 11 a.m. — one per customer, and each customer has to be there. A few more tickets may be released. The team said to check the Nationals website. Parking options at Nats Park start at $20, the team said; you can reserve a spot in advance. Street parking rates in the area will be $2.30 for the first hour, and $8 for each additional hour. There is no restriction on how long drivers can park at those spaces where the additional hours are $8. As the 2018 season kicks off, a new survey said Nats fans can expect to pay a lot for a day at the old ballpark, but Orioles fans have it pretty easy. See where each team ranks for cost of fan experience in Major League Baseball. Thursday will be dry, unseasonably cool and breezy but at least it will be sunny. Temperatures will be in the mid-50s. It wouldn’t be baseball without a little bit of flowing gold, provided you’re over 21. And there are new options for beer lovers this year at Nationals Park. New 25 oz. craft beer can: $16. 25 oz. Budweiser products: $12. Budweiser Terrace has happy hour specials before every Nationals home game which feature $5 16 oz. cans of Budweiser and Bud Light. Happy hour lasts from the time the park gates open to 35 minutes before first pitch. Virginia-based Aslin Beer Co. has also just opened a beer garden outside of Nationals Park. The first 25,000 fans to enter the ballpark will get a 2018 schedule T-shirt from GEICO. Entertainment before the game will come from DJ Flexx, Jeff From Accounting and DJ Stylus Chris. The Family Picnic Area will feature caricature artists, face painters and balloon twisters.